The first step in marriage preparation is to contact the Church. Our Lady of the Pines recommends contacting the Parish Office at least 12 months prior to the desired time of marriage. Our Lady of the Pines Parish staff will help guide you through this joyful journey, replete with excitement - and a little bit of paperwork. During your months of preparation, you are not simply planning for an hour-long wedding, but for a lifetime together filled with joy, happiness, challenges, surprises and love. Newly engaged and seeking to get married at Our Lady of the Pines? Click here to fill out the form to start the process. 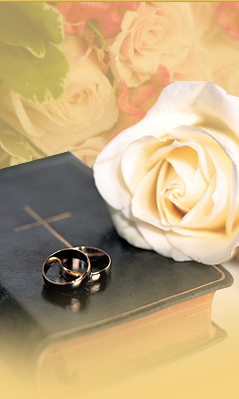 Married outside of the Catholic Church and seeking the Sacrament of Marriage? Click here to fill out the form to start the process. Need an Annulment? Click here and you will be directed to the Diocese of Colorado Springs website.